John Gastil challenges conventional assumptions about public opinion, elections, and political expression in this persuasive treatise on how to revitalize the system of representative democracy in the United States. Gastil argues that American citizens have difficulty developing clear policy interests, seldom reject unrepresentative public officials, and lack a strong public voice. Our growing awareness of a flawed electoral system is causing increased public cynicism and apathy. The most popular reforms, however, will neither restore public trust nor improve representation. Term limits and campaign finance reforms will increase turnover, but they provide no mechanism for improved deliberation and accountability. Building on the success of citizen juries and deliberative polling, Gastil proposes improving our current process by convening randomly selected panels of citizens to deliberate for several days on ballot measures and candidates. Voters would learn about the judgments of these citizen panels through voting guides and possibly information printed on official ballots. The result would be a more representative government and a less cynical public. America has a long history of experimentation with electoral systems, and the proposals in By Popular Demand merit serious consideration and debate. John Gastil is a Professor in the Department of Speech Communication at the University of Washington. He is the author of Democracy in Small Groups: Participation, Decision Making, and Communication (1993). 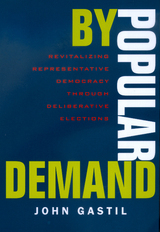 "By Popular Demand tackles two important issues--increasing political participation and restoring trust in government--that are critical to the future of American democracy. John Gastil's careful research makes a solid contribution to the recent literature on the growing divide between the public, elections, and policy decisions. His solutions are worthy of our careful consideration. "—Mark Baldassare, author of When Government Fails: The Orange County Bankruptcy (California 1998) and California in the New Millennium: The Changing Social and Political Landscape (California 2000).